Designed to remove swirls from both fresh and cured paint surfaces while leaving a high-gloss finish. For heavy, cured swirls, best results are achieved by compounding first and then using Swirl Remover. 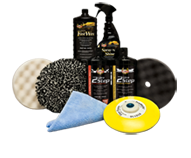 I HAVE USED A LOT OF PRODUCTS IN MY 16 YEARS OF DETAILING AND I HAVE NEVER HAD A PRODUCT THAT WORKS BETTER THAN PRESTA SWIRL REMOVER! 3M CANT TOUCH THESE GUYS. PRESTA SWIRL REMOVER IS EASY TO USE AND DOES NOT WASH OFF LIKE ALL OTHER SWIRL REMOVERS. THE PRICE IS JUST RIGHT FOR WHAT YOU GET. BY FAR THE BEST PRODUCT ON THE MARKET HANDS DOWN!!!! KEEP UP THE OUTSTANDING WORK GUYS!